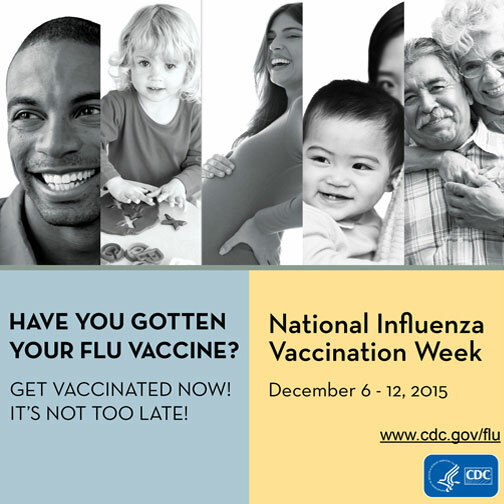 This week is National Influenza Vaccination Week in the US. Established by the Center for Disease Control and Prevention (CDC) in 2005, this week highlights the importance of continuing flu vaccination through the holidays and beyond. Vaccines against the flu are the best defense against the virus and developing flu-related complications. The CDC holds National Influenza Vaccination Week in December as vaccinations tend to drop quickly after the end of November, leaving some vulnerable during the holiday season. Going on vacation or having relatives visiting from afar can expose people to different strains of the flu than what they have built a immune response to, which can spread illness for those unprotected. The flu vaccine protects against multiple strains of the flu viruses. Yearly vaccinations are recommended because flu viruses are always changing, and each year the vaccine is updated to better match circulating influenza strains. In a previous blog post we gave tips on how to avoid the cold and flu. As mentioned there, everyone over the age of 6 months should get a flu vaccine every season. This is especially important for young children, pregnant women, people with diabetes or heart disease, or people over the age of 65. For infants younger than 6 months, the vaccinations of those around them are the only defense against catching the flu. Millions of influenza vaccines have been administered safely over the decades. For those in need of assistance procuring the influenza vaccine our database of free, low-cost, and sliding-scale clinics has information on nearly 3000 clinics that offer immunization services. Search your zip code to find medical clinics near you that may offer free or low-cost immunizations. There is also a web tool called HealthMap Vaccine Finder that shows pharmacies near you that are administering flu shots. Once vaccinated, one can enjoy the holiday season knowing they have taken the best step to protect yourself and your loved ones against the flu.